Kathryn Beal is a homemaker, podcaster, and indie writer. She is the host of The Woke Wife Podcast, co-host of the YouTube channel Ladies of the Culture War, and author of How To Find a Great Therapist. She loves writing about family, homemaking, and personal development. Though Southern born, she currently lives in Northern California with her husband and their adorable baby. Announcing The Woke Wife Podcast! This book is not just about finding a good therapist. 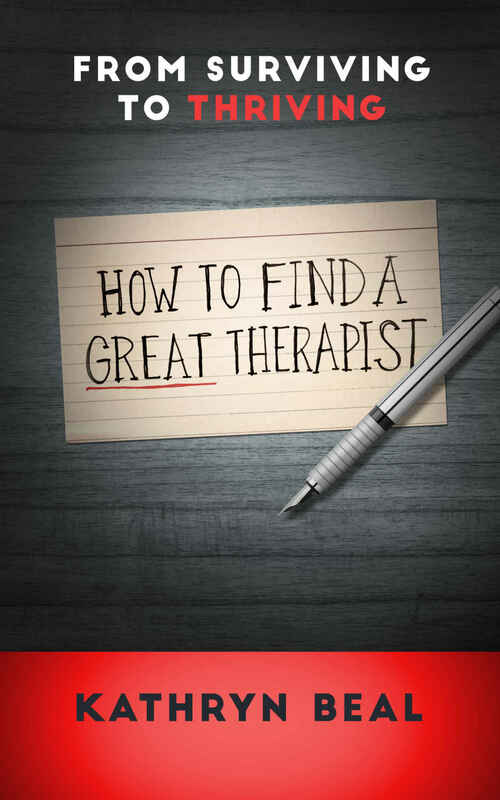 It is about finding a great therapist. The kind of person who will inspire you, challenge you, and change your life. The kind of person who will help you make real progress. If you are just looking for someone to talk to, this book is not for you. Throw a rock and you will find a mediocre counselor who will gladly take your money, go through the motions of “listening” to you for an hour, week after week, and never encourage you to change. And maybe you don’t want to change. That’s fine. Just check out another book, because this one will only stress you out. However, if you want to thrive rather than survive, use this book to demystify the often muddled field of psychology. How to identify an awesome therapist. How to know if you’ve found a bad one. And how to improve your odds of permanent growth. The author takes her years of “couch surfing,” during which she saw over twenty therapists and coaches, to simplify the process and help you make life changes efficiently and with the support you need. This short book is jam-packed, full of principles that you can use to feel confident about an often confusing and stressful transition in your life. Make the choice to change your life and find a great therapist. In our modern world of technology and chaos and stress and never ending complexity, therapy is becoming an increasingly appealing option to many people, both young and old, as a way to find themselves and self actualize into the best version they can be. Psychology however is in it’s relative infancy as a science with endless schools of thought, all differing vastly, and each therapist has their own personal flavor added to that, so finding a good one, or rather even being able to distinguish whether they are any good, is a challenge to say the least. Given this, you’d think there’d be some good resources on the topic, or at least some general direction to look in, and yet surprisingly there are essentially none. The author explains herself in the book how she had gone through a number of therapists, and only through rigorous study and unrelenting commitment was she, over the course of years, able to get a handle on this whole crazy thing. But man, am I sure glad she did! This book is the definitive guide we’ve been searching for, and will be the first and only thing I would ever suggest to anyone interested in therapy. It’s both pleasantly short yet powerfully packed with all you could conceivably need to know on the topic. If you want something straight forward, direct, concise, and endlessly re-readable this is the go to book, hands down. You will find yourself coming back to it all throughout your therapeutic process to check in and make sure you’re staying on the ball in your self growth, or get some clarity on some part of the process you’ve been struggling with. Interested in therapy but don’t know where to start? In therapy but feeling like you’re not making the progress you want? Been in therapy for years and aren’t sure whether you’re “done”? Hell, done with therapy, and want to think “Man I wish I had this book when I started! my life would have been so much easier!” (my situation)? They buy this book! Get the book now on Amazon for $0.99! Here’s a link to my Medium account where you can find all of my articles. Me Too Campaign: Define Your Terms! I’m also an editor for the Medium Publication Self-Knowledge Daily. I’ve written articles for the wonderful blog Mom Loves Baking. I have a YouTube channel. Please check my videos out here.